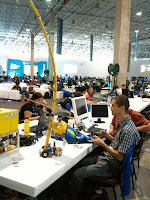 The Campus Party is happening at the Centro de Exposições Imigrantes of São Paulo, where 6 thousand geeks are together, discussing about technology. Insidesaopaulo went there to check it out. Lots of speeches are happening on the four different zones of the Campus Party: Innovation — free software, development and security and networks —, Creativity — blogs, social networks, digital music, design, drawing and video; Science — modding and robotics — and Entertainment: games and simulation. 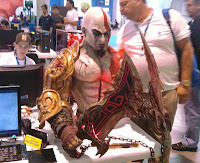 On the modding zone, the highlight is the Case Modding made by Maciel Barreto that represents the character Cratos of the famous game "God of War". He designed it using fibra de vidro, resina and plenty of efforts (photo). Even in the Science zone, there was a technological Berimbau designed to teach students about how use play the instrument. 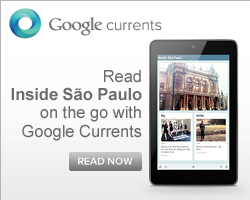 Cristiano Pimentel is the responsible for the devise managed by infrared television control. We will come with more information as soon as possible. Keep following us! How much: For free to visit the Expo area. It is not linked to the entry into the Campers area (sold out).